It was an exciting day for Hellboy fans as Lionsgate has unleashed a new set of posters to throw the spotlight onto the various monsters who inhabit this universe. The poster set also gives a big nod to the movie's comic book influences. It's been a decade, ten long years since Hellboy last hit the screen in Guillermo del Toro's 2008 sequel, The Golden Army. With that much time in between movies, the new version will no doubt take full advantage of the advances in CGI filmmaking that can make movies like this one into instant epics. This time around the main character, our hero Hellboy, is being formulated by Stranger Things' star David Harbour. Neil Marshall is the one in charge of relaunching of the franchise. With the use of the newest CGI tech, along with the scary nature of the Hellboy character himself, this relaunch promises to be more horror driven, possibly bloodier than Del Toro's Hellboy golden adventure. The newest film has been slapped with an official R-rating, so that may foreshadow some of the heavy, violent scenes ahead for fans of the film. The Hellboy comic book creator Mike Mignola has already represented that the new movie is being more faithful to it's comic book source material. Del Toro's adaptation, true to his style, received some flourishes for the screen that may not have been true to the original comic book telling. In line with being authentic, Hellboy's newest storyline arc directly adapts a major narrative right from Mignola's comics. The original comics as well as the movie tell of a battle between Hellboy and the powerful Blood Queen, Nimue played by Milla Jovovich in the roboot. Now Guillermo Del Toro always wanted to make the third part of this movie himself. It was not in the cards for Del Toro then, or now, but it would have been interesting to see if he would be as true to the comic as the new version seems to be. We already know that an R rating has been slapped on Hellboy, but today it was also revealed that Hellboy will have a 2 hour runtime. There have been indications from a faraway German website that the new Hellboy is fully finished and has a runtime of exactly 120 minutes. The German title for the film is reported to be Hellboy: Call of Darkness. The title was garnered from that limited series Hellboy comic "Darkness Calls". That title is one of the influences for the film as well as "The Wild Hunt" and "The Storm and the Fury". The info keeps coming in as we lead up to the April 12th release of Hellboy. When the movie comes out the producers hope to be able to bridge the gap of a super violent film being digestible to a huge wide scale mainstream audience like the movie Deadpool did. 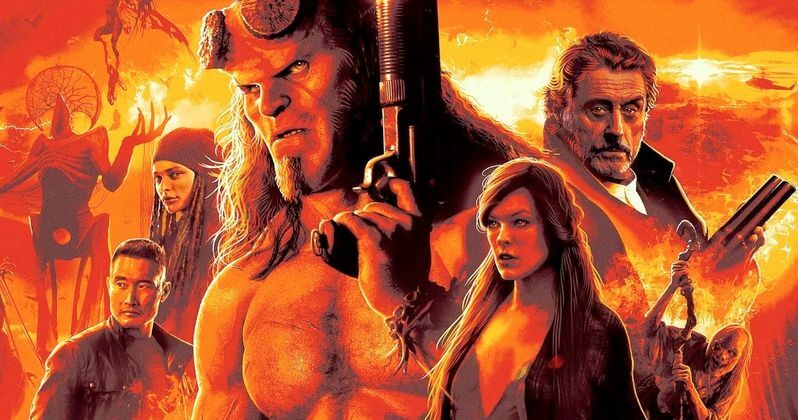 The newest graphics for the movie can be seen in the new poster series of images released by Lionsgate to whet our appetite until Hellboy opens next month. These arrive direct from Lionsgate Twitter.